Life expectancy in the UK is 79.2 years in males and 82.9 years in females. Average age at diagnosis of bladder cancer is 73 years, but incidence continues to rise with age. Elderly patients represent a unique cohort of patients; they often have multiple co-morbidities, and may have different wishes than younger patients. We describe our current bladder cancer practice in patients over the age of 85. Retrospective review of patients aged over 85 years, first diagnosed with bladder cancer between Jan2013 and Jun2016. 102 patients were identified from our database. Mean age at diagnosis was 88.34 years. Staging at diagnosis was: 75 non-muscle invasive bladder cancer (NMIBC) (17 low, 13 intermediate, 45 high risk), 23 muscle invasive bladder cancer (MIBC), 4 with synchronous metastatic disease. Of the 75 patients with NMIBC, 29(38.7%) had a recurrence, 4(5.3%) were upstaged from low to high risk, 9(12%) progressed from NMIBC to MIBC. 38.7% (29/75) of NMIBC patients declined treatment or surveillance during the follow up period. Overall, 53% (53/102) died of any cause, mean interval 2.0 years from diagnosis. 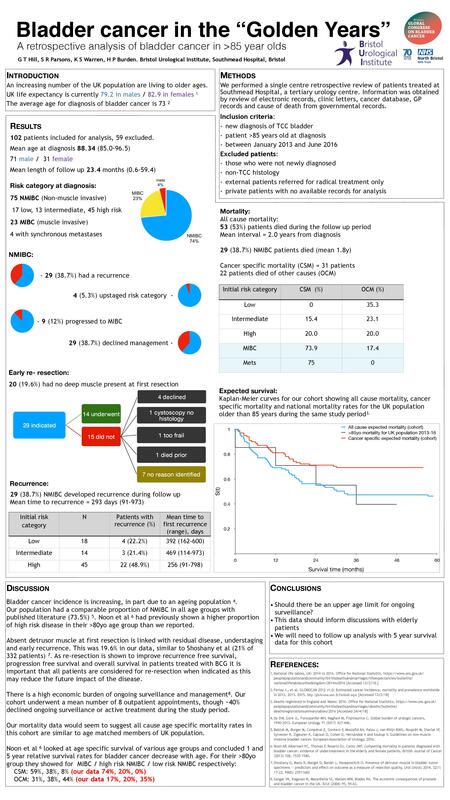 40% (30/75) of NMIBC patients died of any cause since diagnosis (mean 1.8y). 28 patients died as a direct result of bladder cancer, 16 from other causes. In our cohort of bladder cancer patients over 85 years old, there is a high overall mortality rate within a relatively short time period following diagnosis. This data should aid well informed discussions with our elderly bladder cancer patients and their relatives when considering treatment and surveillance options.